While Thailand celebrates Buddhist New Year with water fight, I am in Ho Chi Min City, Vietnam once again for a much needed vacation. Three of us flew in this morning. A friend tagged along. It is her first visit to the country. Big sis and I are no longer strangers to this SEA nation. So having been able to familiarize ourselves with the city during our Christmas escapade, we will be serving as the travel guide for our friend. We started our four-day adventure with a brunch at PHO 24, a Vietnamese noodle chain with shops all over Vietnam. But before the feast at the noodle restaurant, we passed by a small shop just around the corner from our hotel selling French Baguette sandwich. I missed it during our Christmas trip as there were no shops like this in the Japanese area where we were lodged. The lady cut the baguette in half lengthwise and made a cavity in the middle. She put the whole content of canned sardines in the hollow, arranged sliced cucumber and carrots and topped it with cilantro. 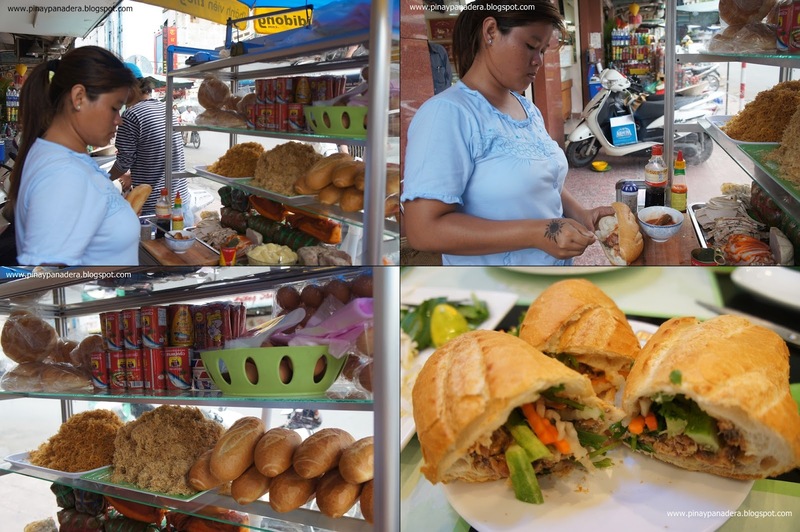 For 20,000 Vietnamese dong ( about $1), it was a reasonable price for a sandwich complete on its own. Lots of filling to choose from. Sardines, shredded pork and chicken to name a few. We ate it with gusto. Pho 24 outlet in Ben Than Ward District. The noodle soup was served with a plate of greens which you can add accordingly. I ordered mango smoothie, big sis had soursop juice and Maggie had avocado smoothie. My beautifully decorated pho. For me, this noodle soup was tastier than its Thai counterparts. Our first pho experience was gratifying that I had it few times during the trip.